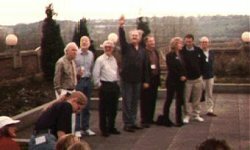 Deliverance '98 was a fabulous convention this year, and it'sthe largest group of Blake's 7 fans I've seen together before. 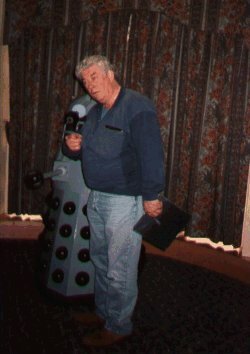 I managed to get talking to manyof the original cast, bumping (literally) into Gareth Thomas (Blake) a few times andhaving a real good chat which I'd never managed to do before. I also had a long sit downwith Sheelagh to discuss her book Blake's-7. The inside Story'. She's a very nicelady who gladly pointed out all the errors that had been made in the book! The obligatory photos and autographs were also gathered from some of the original cast. The guests that did attend (I think this is all) were : Gareth Thomas, Jacqueline Pearce, Peter Tuddenham, Jan Chappell, Sally Knyvette, Michael Keating, Stephen Greif, David Jackson, David Maloney, Chris Boucher, Sheelagh Wells, Joe Nazzaro, Mat Irvine, Stuart Fell, Brian Lighthill,Brian Clemett and Mike Tucker. All in all, I had a great time! 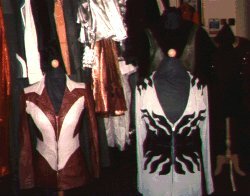 Some of the original costumes used on display in the exhibition room. I'll leave it to you to workout the episodes and the actor/actress that wore them! Some of the cast! From left to right here we have, Peter Tuddenham, Chris Boucher, Brian Lighthill,David Jackson, David Maloney, Sally Knyvette, Stephen Greif and Brian Clemett. Apologies for the poor quality as I dropped my camera, and it seems to have done a bit of damage. 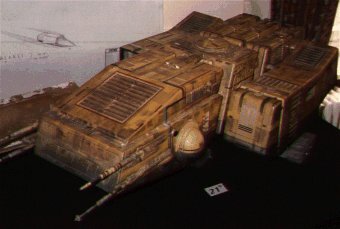 Several of the original models here, including a Federation Interceptor, and a model from one ofmy favourite episodes. The miniaturised 'Orac' from Gambit. 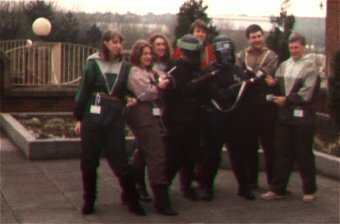 Caught these people holding some Federation guards. Good outfits!